First place - $5,000 and an automatic advancement to the semi-finals of the Minnesota Cup went to Alejandro Lalama '19, Jack Morri '19, and Can Thierhoff '19 for CapakÑan. Second place - $3,000 went to Nick Elder '18 for Block Capital Insider. Third place - $2,000 went to Allison Anderson '18 for LITT FIT. Jacob Herd '18 received $300 for coming closest to correctly predicting the winners. Boche Boards is a simple and modern app for today’s society that allows you the convenience of scorekeeping on your mobile device. With the help of software consultants here at GAC, we will create an app that can connect via Bluetooth to scoreboards. This eliminates the original method of scorekeeping along with the controller and wires, replaced by an app on your smartphone or tablet. Our team consists of athletes who have had managers run the scoreboard during practices, with Boche Boards, coaches can run the scoreboard conveniently during practice which eliminates the coach to manager miscommunications. LITT FIT exists in order to serve those looking for a new, alternative way to work out and be healthy. Our market analysis showed that there is a rapidly growing demand for fitness clubs that are geared towards millennials and offer social and personalized workouts. LITT FIT strives to tear down every limitation to having fun while working out by incorporating a mobile truck, arcade lights, loud music, instructors that bring the intensity, and cutting-edge classes that are trending in the market. Our mission is to empower our clients by growing their physical capabilities through hard work, teamwork, and dedication. This would be the student version of programs such as endnote. It would do two main things. The first is that it would allow people to "highlight" and "tab" related passages on PDF and other files, across documents. It would put these "highlights" into corresponding folders for different topics within the same project, such as blue for topic 'A', red for topic 'B', etc. It would allow for different projects for different courses, and the different colors within each project. The second thing is that it would help students track and cite their sources. Block Capital Insider is an educational platform committed to providing interactive and cutting-edge information on the blockchain space in one easy to understand format for individuals looking to gain entry into the digital asset market. BCI’s “Cryptocurrency Value Investing Program" will deliver four hours of compact, easy to understand videos. BCI’s innovative five-module course will take our students from novices of blockchain technology, to a level of understanding far beyond many of the world's financial elites. With the knowledge gained you will be able to safely and securely identify and invest in digital assets of the highest intrinsic value. We are Zzz’s Coffee, a small business focused on providing an excellent product and experience for our customers. As we offer a 24-hour service and multiple spaces for working as well as relaxation, our customers receive a unique coffee shop experience any time of the day and night. We aim to provide these services to primarily college students, entrepreneurs, and business people that enjoy working away from home with a quality cup of coffee. Located in the twin cities area, we reach a broad customer base. For dedicated customers, we provide a premium membership with perks. A major concern when entering college is all of the expenses that come with it. A problem seen at universities all around the country is the high prices of textbooks. This issue has been prevalent for many years. Our business, Books n’ Stuff, is a database that acts as a medium of exchange for people selling their used textbook with someone looking to purchase it. At its core, the mission of Books n’ Stuff is to reduce the cost of the college education and to put money back into the pockets of students. 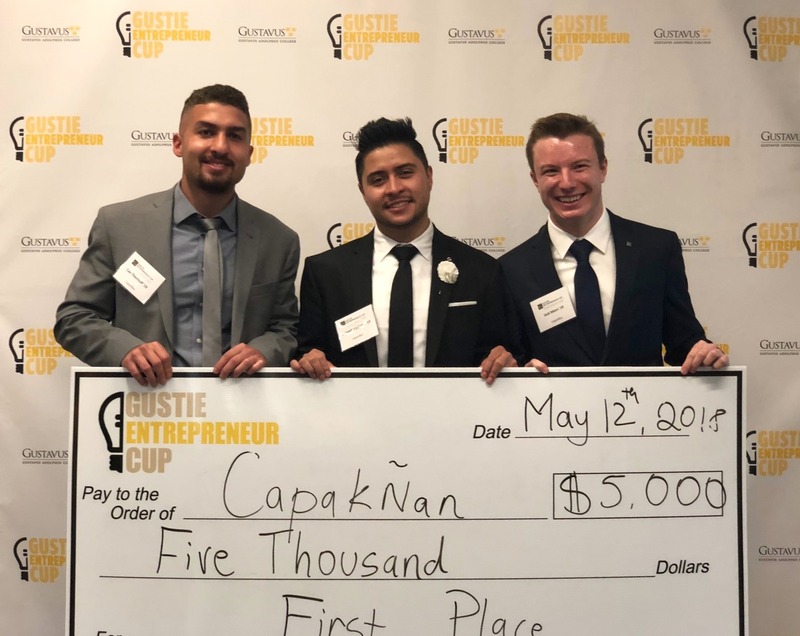 Capakñan was founded on the idea of helping others live their best lives. We started with the idea of helping indigenous communities of Ecuador to be more environmentally friendly. We partner with indigenous communities of Ecuador to produce the first and only nutrition bar made with unprocessed quinoa. We offer quinoa based protein bars that are 100% organic and allergy free. Currently, we have the CHIMQUI snack bar for everyday, on the go activities and the CHASQUI protein bar for those looking to get more out of their workouts. Each purchase of these bars means you are helping Ecuadorian farmers in need. Simply Secure Innovations has a proposed solution to alleviate package theft. We have a uniquely designed, first of its kind door; the DeliveryDoor, which aims to give consumers confidence in the security of their package. While maintaining a cosmetically appealing look, we have added a sliding mechanism, within the door, that will guarantee the safety of packages. People all over the world are discovering the health benefits and convenience of bone broth. These individuals are starting to substitute bone broth for coffee and broth is trending as a health food. In August of 2015, the first bone broth bar in the United States opened in Portland, Oregon. Currently, in the Minneapolis-Saint Paul area, there are no broth bars, just a single wholesale provider. In a community with a cold environment and health conscious citizens, we believe that there is an opening in the market for a bone broth bar to thrive in the Minneapolis-Saint Paul area.